Claremont made it a second straight thumping to open the season beating West Perth 14.4 (88) to 4.8 (32) at HBF Arena while Subiaco also won big again, thrashing East Fremantle 13.12 (90) to 7.3 (45) at New Choice Homes Park. It was another tight affair at Leederville Oval with East Perth beating Swan Districts 7.14 (56) to 7.6 (48) for their first win of 2019 to leave the Black Ducks winless with two narrow defeats. It's not often a defender who doesn’t rack up huge intercept or rebounding numbers will get highlighted by winning an award like Player of the Round, but Anton Hamp once again showed just how valuable he is to Claremont in Saturday's win over West Perth. The biggest threat to the Tigers not coming away from HBF Arena in the Round 2 contest was if Andrew Strijk kicked a bag of goals for West Perth, especially in the absence of the suspended co-Bernie Naylor Medallist from last year, Tyler Keitel. While Hamp didn’t spend the entire game opposed to Strijk, he did spend extended periods opposed to him and the fact that he helped hold him scoreless was a significant factor in the Tigers coming away with the 56-point victory to remain unbeaten to start 2019. The start to the season for Hamp continues a tremendous run of form as one of the league's best and most consistent defenders now. Coming through the ranks as a key forward, he could never quite cement his place in the strong Claremont Grand Final teams to start this decade. By the time he did cement a spot in 2013, the Tigers' were on the back end of their dominant stretch and then when the goals weren’t quite coming, he was moved down back and has never looked back. Hamp is now a 130-game WAFL veteran with Claremont and would be the first player picked every single week by coach Darren Harris for the way he is so consistently impassive in whatever defensive role he's asked to play. While also criminally underrated outside the walls of Tigerland, he remains one of the most important factors in Claremont's push to be a genuine premiership threat in 2019. As he approaches having played 150 WAFL games, he remains at the top of his game and is as important as ever at South Fremantle given the experience lost over summer and with Dylan Main and Marlion Pickett currently sidelined. Tremendous down back on Saturday with 24 possessions and eight marks. Another player who might be underappreciated outside the four walls of the club, but remains one of the most consistent players in the competition and among the best intercept and rebounding defenders. Has started the season strongly and again in win over South Fremantle finished with 22 disposals, 10 marks and five entries inside the forward 50. The ever-reliable East Perth defender who over the past 18 months has branched out to play midfield, ruck and even forward is another to have begun 2019 impressively. Was instrumental in the Royals' win over Swan Districts with 29 possessions, six marks, five tackles and five inside-50 entries. He is the reigning fairest and best winner at Swan Districts and now has 220 WAFL games under his belt, and did all he could on Saturday to try to get his team over the line against East Perth at Leederville Oval. Ended the afternoon with 20 possessions, six marks and four inside 50s. It's obviously not an easy West Coast AFL side to break into, but he is doing all he can at WAFL level to start the 2019 campaign to make a strong case to break down the door for a spot in the back-line of the reigning premiers. Racked up 27 disposals, seven marks and four tackles in an impressive display in the win over Peel Thunder at Optus Stadium. If anyone thought the remarkably decorated Subiaco legend might be getting to wind down his career having given up the captaincy in 2019 should have waited for him to play the first two games of the season. Is playing as well as ever with the Lions winning big again East Fremantle with him finishing with 29 touches, nine tackles, eight marks, six inside 50s and two goals. The dual Sandover Medallist deserves to consider himself lucky not to be on an AFL list in 2019 but he's not letting that get him down, instead starting the new season in hot form in the Claremont midfield. Produced another 36 possessions, seven inside-50 entries, five marks, five tackles and a goal in big win over West Perth. Claremont's other Sandover Medallist has started the season in terrific form as well and the running machine had a big outing in the thrashing of West Perth at HBF Arena. Ended the afternoon with 37 possessions, eight marks and eight tackles while driving the ball inside-50 on five occasions. Over one summer has turned into one of the most experienced players at South Fremantle and the 2017 Sandover Medallist did all he could to try and inspire the Bulldogs to a win against Perth on home soil on Saturday. Ended up kicking three goals from 17 possessions, six tackles and six inside-50 entries. The remarkably versatile dual premiership winning big man remains an unstoppable force spreading himself through playing in attack and the middle of the ground for Subiaco. Another tremendous showing in win over East Fremantle made up of 26 disposals, 15 hit outs and eight marks. 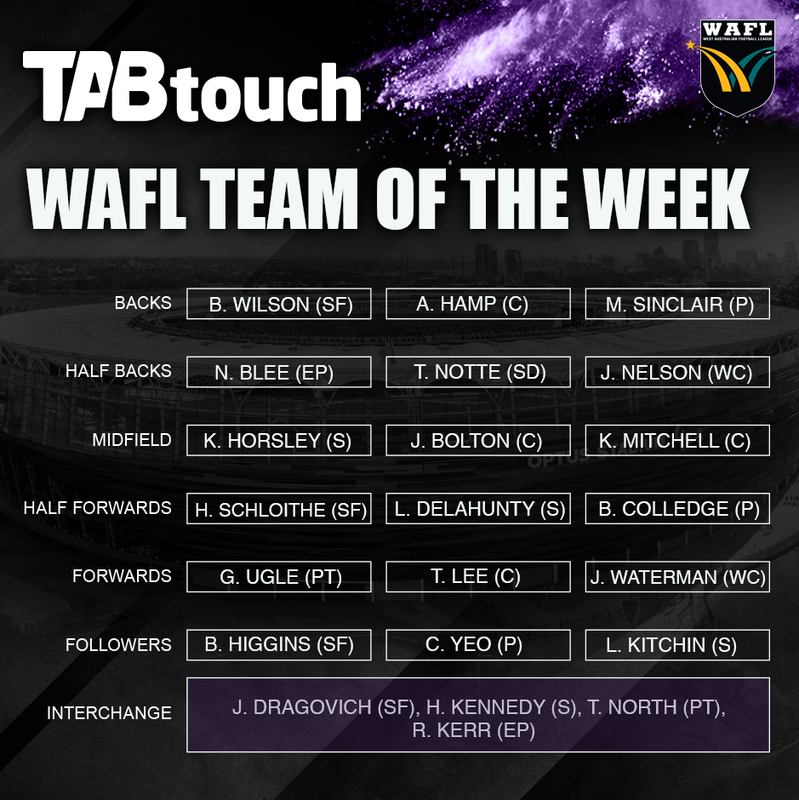 The reigning Perth fairest and best winner remains in the form and fitness of his life, and has made the WAFL Team of the Week for the second straight time to start 2019 on the back of making the Team of the Year. Had 33 touches, eight marks, eight inside 50s and seven tackles in narrow win at the port over South Fremantle. He might not be captain at Peel this season and might not be winning huge amounts of the ball, but as a small forward he is kicking goals and applying terrific defensive pressure. Despite the Thunder losing to West Coast on Sunday, he did what he could in the forward-line kicking two goals from eight possessions and eight tackles. He is now undisputedly the main target in attack for Claremont and with a quality midfield feeding him, he is grabbing his chances and the spearhead was pivotal in Saturday's big win against West Perth. Ended up kicking five goals from 10 kicks and five marks. He might have lost his place in the West Coast AFL forward-line early in 2019, but couldn’t be in more impressive form at WAFL level with the Eagles trying to demand his spot back. Kicked five goals for the second straight week in Saturday's victory over Peel at Optus Stadium from 19 possessions and nine marks. 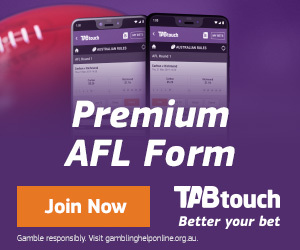 For the second week in-a-row to open the new season he took on two opponents in the ruck virtually single-handedly and got the better of the duel as the reigning state ruckman has started 2019 in some supremely impressive form. Finished Saturday's game against Perth, opposed to Christian Eyres and Guy Langdon, with 11 possessions, three tackles and a monstrous 57 hit outs. The new Perth captain is showing that captaincy is agreeing with him early in the 2019 and he led the Demons to a second straight victory against South Fremantle on Saturday. He was terrific leading the way in the midfield too finishing the afternoon with 29 possessions and 11 tackles. The new Subiaco captain is another to show that the leadership role agrees with him after he put in a big performance in Saturday's 45-point win for the Lions against the Sharks. Finished the game with 27 possessions, six tackles, two marks and two inside-50 entries. Has been a regular member of South Fremantle's side for a couple of years now, but with the departures over summer he will assume a more important role in 2019 and he is showing he is more than up for him. Had a career-best outing in Saturday's narrow loss to Perth finishing with 41 possessions, nine tackles and six marks. 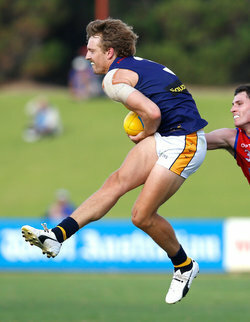 The dual Subiaco premiership small defender has started the 2019 season as well as he finished 2018 and whether he is playing a defensive role or being a creative force coming out of half-back, he remains invaluable for the Lions. Had another strong game on Saturday against East Fremantle with 18 possessions and four inside-50 entries. The Fremantle-listed ball magnet has now put together two impressive showings to start the WAFL season with Peel and has to be getting close to an AFL call up with the Dockers. Finished with 28 possessions, seven tackles, four marks and four entries inside the forward 50 in loss to West Coast at Optus Stadium on Saturday. The former West Perth premiership star has shown that two years out of the WAFL hasn’t taken away any of his ability to be one of the premier running machines in the competition, even if it is at the club he starred against in the 2013 Grand Final. Finished with 27 possessions and seven marks in narrow win over Swan Districts. Subiaco's Ryan Borchet, Rhys Waters, Josh Deluca, Max Walters, Rowen Powell, Greg Clark and Jordan Lockyer. East Fremantle's Jarrad Jansen, Jayden Schofield and Morgan Davies. East Perth's Jackson Ramsay, Will Maginness and Angus Scott. Swan Districts' George Hampson and Nathan Blakely. Claremont's Lachlan Martinis and Declan Mountford. West Perth's Shane Nelson, Corey Chalmers and Trent Manzone. Peel Thunder's Mitch Crowden and Ben Hancock. West Coast's Matthew Allen, Brendon Ah Chee, Hamish Brayshaw and Fraser McInnes. South Fremantle's Mason Shaw, Zac Strom, Jake Florenca, Kade Stewart, Brendan Verrier, Chad Pearson and Zac Dent. Perth's Corey Byrne, Cody Leggett and Matthew Taylor.